Phase 1 of the new Horseshoe Casino in Cleveland opens tonight, and I got a sneak peak last week along with some of the local media. As you can see from the photos I took, the renovation of the historic 81-year old Higbee’s Department Store in the heart of Downtown Cleveland has resulted in a beautiful and unique space that will become a featured attraction in C-Town for years to come. The designers were able to incorporate many of the classic features from the old department store and work them in with the Horseshoe brand, particularly the chandeliers and lighting fixtures. Also, most of the old bronze fixtures like the original Higbee doors were fully restored. The new casino blends a classic and modern feel, with high-tech, big-screen slot machines and gambling tables filling the historic space. It’s elegant but also inviting, and I can’t wait to see it when it’s packed with people with cheers coming from the craps tables. The casino takes up 4 floors of the old building. The main floor is located at street level and will be the primary floor for gambling activity. This was the featured floor of the old department store with big columns, high ceilings and amazing chandeliers, and it provides the perfect space for loads of table games and slot machines. It also features a small but elegant bar area called Legends at Horseshoe. The next floor up features more table games and slots, along with a much bigger bar area in the heart of the space called Vintage 51 that will likely become a popular nightlife spot. This 2nd floor area also features a food court area with three local eateries, including Iron Chef Micheal Symon’s B Spot (burgers), and a high limit gambling area. The ceilings are lower on this floor so it has the cozy feel of an old-school Vegas casino. The new casino is owned and operated by Gilbert’s Rock Gaming LLC, and Gilbert struck a deal with Caesars Entertainment’s Horseshoe brand to handle the day-today gaming operations. With that comes the Total Rewards players club featured at all Caesars properties, so players can rack up points in Cleveland and use them in Vegas or other Caesars location around the world or vice versa. Players can sign up online or at the casino for free. Benefits at Horseshoe Cleveland include 24-hour free self-parking for Total Rewards players who play for 30 minutes and earn at least 15 Tier Credits. Unfortunately, Ohio law prohibits complimentary drinks, but Total Rewards members can earn discounts, and the new, high tech slot machines let you place your order right on the machine as opposed to waiting for a waitress. I like the way the tables are laid out on the two main floors, and was encouraged to see traditional Blackjack tables. One disturbing trend in Vegas has casinos pushing one-deck Blackjack games that only pay 6-5 on Blackjack, which seriously affected the odds in the casino’s favor. It’s a game for suckers, but all the tables at the Horseshoe Cleveland seemed to have standard shoes and traditional 3-2 payouts on Blackjack. The top floor of the new casino features a 30-table World Series of Poker Room that is beautifully laid out. I can see spending a lot of time there in marathon poker tournaments, and poker should draw plenty of players to the casino. This top floor also features a stunning VIP players lounge for Diamond Club and Seven Stars Total Rewards members that you can see in photo #7 in the slideshow above. It’s beautifully laid out and it will be interesting to see if they ever permit others to come in with a cover charge, as it has the potential to be destination spot for big spenders. The new casino is accessible from multiple entrances, including several from the adjoining Tower City complex, a massive mall created from a previous renovation project of the Tower City subway station. The bottom floor of the casino can be accessed directly from the Tower City mall and features 400-seat buffet but no gaming. Additional entrances are available from the main floor of the mall. The casino will likely breathe new life into this beautiful urban mall along with the rest of the downtown area. 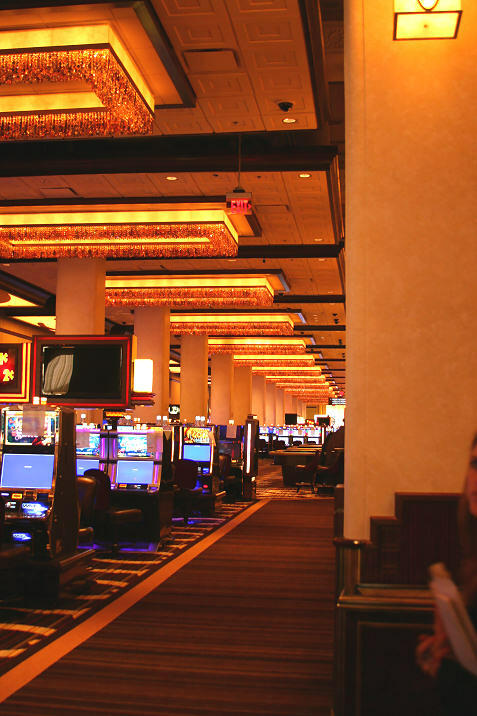 The Horseshoe Casino has numerous alliances with restaurants and hotels throughout the downtown area that will benefit players and also spur more economic activity. The Cleveland casino wasn’t developed to be an entirely self-contained entertainment complex like others around the country that you find off of a freeway. Instead, players will be able to easily venture outside and enjoy everything Cleveland has to offer, including nearby Cavs and Indians games. You can follow the casino on Facebook and Twitter for updates and specials. Cleveland is buzzing over the new casino, and I expect it to attract many players from the Cleveland metro area along with becoming a destination spot for the region. It should also breathe more energy into the Cleveland nightlife scene. I can’t wait for my first roll of the dice!